Earlier this year I wrote a piece about why I wasn't ready to swap my sports watch for a smartwatch. While Apple, Samsung and Google's Android Wear-running watches have come on leaps and bounds over the past 12 months in the sports tracking department, I still felt they came up short next to a top end Garmin, Polar or Suunto when it comes to delivering when it matters most: on race day. When the Apple Watch Series 3 turned up, I thought it was a good opportunity to return to that debate and see whether anything had changed. This time I was putting it to the race test. I've run plenty of training runs with the Apple Watch, but I've never run a race relying solely on a smartwatch to monitor my performance. That wasn't going to change now, but I was willing to put the Series 3 on one wrist and see how it fared against a dedicated sports watch like the Garmin Forerunner 935 on the other. Could it actually deliver a similar or even better experience? Would the data match up with the chip baked into my race bib and the 935? These were just some of the questions I wanted answered – and the perfect opportunity to do it came up. 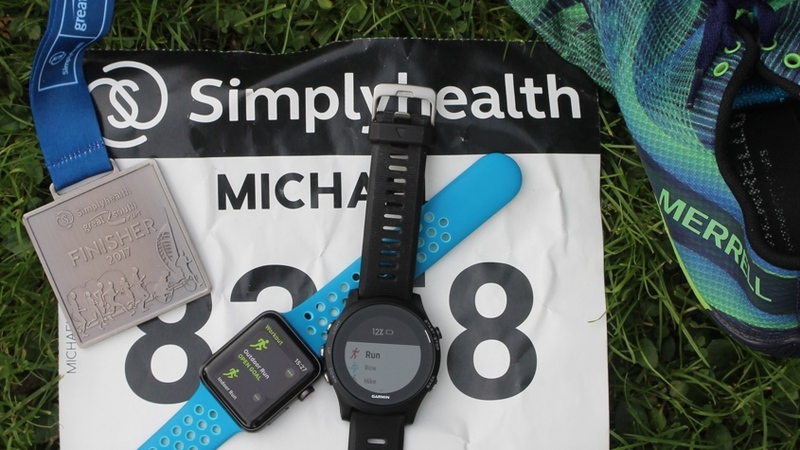 The perfect opportunity came up when I was invited to take a place in the Simplyhealth Great South Run, a relatively flat 10 mile course in Southsea, Portsmouth out on the southern coast of England. I'd already used the Forerunner 935 for a few races before, but this was a race debut for the Series 3. From getting set up to using during the race and sifting through the data later, here's how the latest Apple Watch fared when it came to the race test. Carb loading and getting a proper night's sleep aside, the number one priority is getting that race kit ready and from a wearable tech point of view, that usually means a couple of things: charging and making sure all the right settings are ready to go so you're not fiddling with them on the start line. When it comes to charging, that wasn't something I really needed to worry about with the Forerunner 935. It was near enough 90% and I knew a 10 mile run, even with heart rate monitoring switched on, wouldn't leave a massive dent. It's a slightly different story for the Apple Watch. While battery performance has clearly improved from the Series 2, when you factor in using those GPS and heart rate sensors even for a couple of hours, I know it's going to take a hit. So it had to be at 100% before using it the next day, which meant it definitely had to be left on charge overnight. When I talk about getting those settings in order, I'm talking about making sure the right data fields are going to be displayed on the watch faces to make sure I can quickly gauge how well I'm performing during the run. Also, whether there are any extras that could come in handy. With the Watch Series 3, I was focusing on using Apple's own Workout app as opposed to turning to one of the many third party running apps that it now supports. Things are kept basic, which is not necessarily a bad thing. Inside the Watch companion app back on my iPhone, the Workout app throws up a few options. There's a power saving mode that turns off mobile data and the heart rate sensor to improve battery life, the ability to turn on auto pause and assigning a playlist that'll start playing when your session begins. In all honesty, I wasn't all that interested in turning on any of these, particularly auto pause as that doesn't really give you an accurate account of your race. Those drinks breaks do count. As far as data fields are concerned on the Apple Watch, you have the choice of displaying single or multiple metrics on the screen. It's all the things I'd expect to see; duration, average pace, heart rate and distance. There are also additional metrics: current pace, active calories, total calories and elevation gain. The latter is a new addition for the Apple Watch and crucially all of that data is recorded even if you choose not to display it in real-time. One thing I wanted to get sorted was ensuring distance tracking was displayed in miles instead of kilometres. It's not immediately obvious how you do that though. You have to go to the Watch and head into the Workout app, select Outdoor Run and swipe across to find the distance settings. A firm press on the screen puts Force Touch into use then lets you switch between the two. With the 935, we are talking one of Garmin's top end running watches. It costs more than the Series 3 but it's jam packed with features. The good news is that you can pretty much avoid Garmin's Connect companion app to get things in order. You do have to negotiate a fair few more menus than you do on the Apple Watch, but once you know what you're looking for, it's pretty straightforward from there. I could have set up alerts, turned on auto lap or pause modes and much more. Quite frankly though, I like to keep things simple and thankfully you can still have a pretty simplistic running experience if you don't want to be bogged down by additional running metrics. I'm not running until around 10am, but routine dictates that I need to be up early, like 6.30am early, to make sure I've eaten and given my body enough time to turn it into running fuel. Once I've showered, eaten, got the kit on and pinned on my race number, the Apple Watch is one of the last things I put on, because I'm already thinking about how the battery is going to hold up. It's easy to gloss over something like watch straps, but for running it's a big deal. Even the smallest things can put me off my game, including an uncomfortable strap, and I'd have to say that Apple's own sports bands are some of the most comfortable I've run with. They don't feel as restrictive or tight as some sports watch bands can do at times, including the one on the 935. So hats off to the folks at Cupertino on the bands. I've also decided to run with my iPhone, opting against moving some music onto the Watch and pairing it up with some Bluetooth headphones. That decision could've been different had there been some Spotify offline playback support, but sadly it doesn't look like that's turning up any time soon. I'm in my starting pen, half heartedly going through the warm up routine with the thousand other runners, but I'm more occupied with making sure my two watches are ready to start tracking. The Garmin requires a few more minutes than the Apple Watch to lock onto a GPS signal so I have to deal with that first. But you can often be waiting past than the intended race start time and before I know it, the 935 is moving into power saving mode after finding a signal and I need to activate run tracking again. I don't need to touch the Apple Watch because locking onto a GPS signal usually takes seconds. It's one thing Apple has really nailed here. Lunges completed, it's time to head to the start line and get running. I'm off and tracking and the first thing I notice is that Apple's gesture mode that lets you raise your wrist to wake up the screen works flawlessly. It's not something you can say about the majority of smartwatches that offer the same feature, but nobody wants to be doing this action multiple times during a race to get it working properly. One thing I did regret was not opting for a single metric display on the Series 3. I found it a challenge to quickly absorb the data squeezed onto the screen. Breaking metrics down with different colours definitely helps, but I felt I could get a better feel of my performance on the 935's screen, which isn't all that bigger but does a better job of presenting the real-time metrics. We talk a lot about buttons and touchscreen controls on smartwatches, and in the case of the Apple Watch, I think there's still something to learn from companies such as Garmin when we start talking about sports tracking. Pressing a button as opposed to swiping a screen in the middle of a race to view additional metrics is definitely easier and considerably less fiddly. The same applies when the race is done. I was sweaty and flustered and then remembered that I had to stop the tracking. One press on the Forerunner 935, and it's done. My natural reaction was to press the digital crown on the Series 3, but that doesn't do the job. I hit the button below and that doesn't work either. A minute or two later I finally remember I need to swipe across to end the workout – before that though, I'd added that minute or so to my time. Using one of the physical buttons to end a workout seems like a no brainer as far as features that Apple should nab from sports watches go. After a refuelling with a plate of paella, catching up with some running pals, and with medal and finisher t-shirt on, it's time to head for the train and get back to London. A look down at both watches show that the Apple Watch Series 3 has taken about a 20% battery hit as opposed to the roughly 10% that the Forerunner 935 is down by. Both will make it through the rest of the day that's for sure, but now it's time to sync the data and see how I actually got on. For the Watch Series 3, it's over to the Activity app where I can see my completed rings and can scroll down to see my tracked workout where there's a nice snapshot of those core metrics like distance and average pace. There's also a drop-down menus for splits, segments and heart rate. For most runners, including myself, that's all the essential data I need. It's a similar story of course with the Forerunner 935 and Garmin Connect, where there's significantly more data to drill into. Both though will give you a very quick idea of that race day performance. For tracking accuracy, I wanted to focus on some of those basics like making sure the correct distances were recorded, along with average pace and splits. The stats (below) reflect those couple of minutes of fiddling around with the Apple Watch at the end of the race, but distance tracking was largely right while average pace jumped up a few seconds. Digging into the splits and the stories of the race from the Series 3 and the Forerunner 935 are similar if not identical. Some individual miles registered a little slower on the Apple Watch but only by seconds. Overall, it did a fine job on this front as well. The Series 3 doesn't appear to offer an insight into maximum heart rate at first glance until you really examine those graphs closely. As far as the average bpm reading, it was significantly higher than the chest strap. While the Forerunner 935 was closer to that chest strap for average readings, it appeared wildly off as far as max readings were concerned as well. So it's another case of optical sensors failing when things get intense. In other words, don't ditch that chest strap just yet. This is the big question. Would I grab an Apple Watch instead of a Garmin or a Polar for my next race? Honestly, it's still a no for me. While I don't have any major concerns with the data and that in-race experience, some hardware and software quirks still concern me. For longer distances, I'd question whether that battery life is yet good enough to well, go the distance. The UI could still be refined and those physical buttons could be put to better use as well. Third-party apps can definitely help rectify some of these issues, but I'd like to see Apple put some work into its own app. Yes, touchscreens are great, but buttons are great too, especially when you need to get to those metrics quickly without issues. My race experience with the Apple Watch Series 3 was good and it didn't throw up any really big issues, but I'll be keeping hold of my sports watch for a good while yet. Thanks to Simplyhealth for securing our place in the Great South Run.